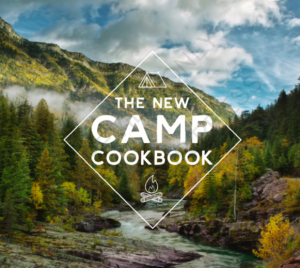 This camp staple is a classic, foolproof recipe for a fresh catch of the day. Kitchen twine holds the lemons and scallions together, but un-waxed, plain dental floss works in a pinch. Prepare a grill over medium heat. Season the trout inside and out with salt, pepper, and garlic powder. Stuff each trout with 2 sprigs thyme, 1 sprig rosemary, and a row of lemon slices. Layer one fourth of the remaining lemon slices and 2 scallions on top. 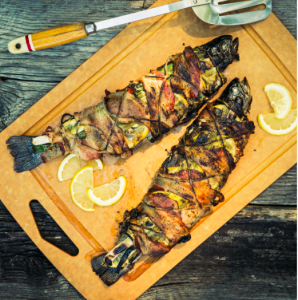 Wrap the trout with bacon, starting at the tail and tucking the end of the bacon strip under itself before continuing with another strip. You’ll need 4-5 strips of bacon per fish. Tie a long length of kitchen twine around each trout to secure the fixings.